Tyler Florence is going to kill me. Okay, maybe not, but it's not that bad. It's actually got some pretty good flavor and the sauce is nice and creamy. I've seen countless recipes passed around on Pinterest and other DIY friendly websites. And for good reason. It's a pretty decent version. The one thing I will say that is has going against it is that you can taste a bit of that kind of "perservative", pre-made kind of flavor. Something you'd expect maybe from a box of Kraft mac and cheese or some other easily prepared version of the dish. And for that, I cannot put this dish into my top ten. However, it's pretty good if you find yourself out and about, especially since there's a Panera Bread pretty much everywhere. So fear not, non-San Francisco Bay Area readers! 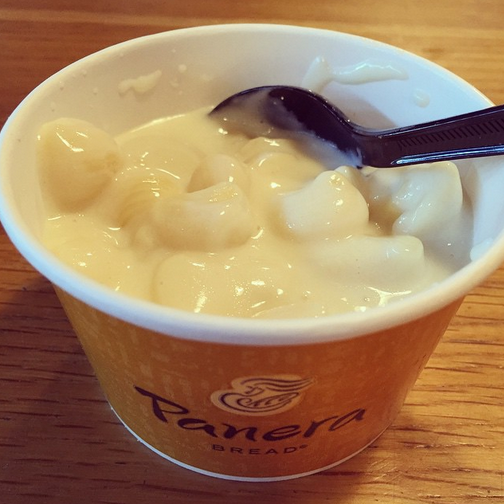 There is a great mac and cheese near you, too!